This is the time of year where evergreens are festively decked out in red ribbon and twinkling lights and festooning homes and cities around the globe. But did you know you were following in the footsteps of ancient cultures from all over the world who used green plants in their own winter solstice celebrations? Beginning thousands of years ago and culminating in today’s ubiquitous Christmas tree, greenery has long been a cherished holiday decoration. 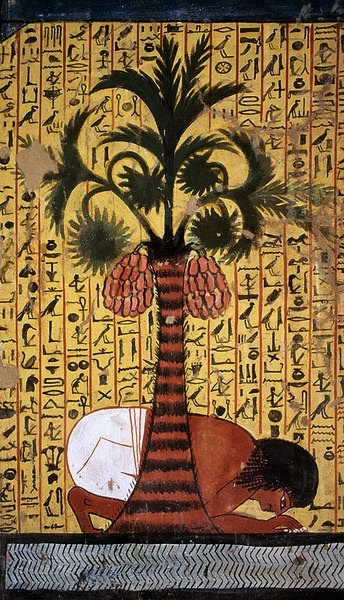 Tomb painting: from the tomb of Pashedu, son of Menna, showing him crouching next to a stream and a date palm in the lower world. The ancient Egyptians worshipped the sun god, Ra. They believed that winter was brought on by the departure or sickness of Ra. At the winter solstice, in anticipation of Ra’s return, the Egyptians would fill their homes with green date palm rushes that symbolized Ra’s recovery and triumph over death. Ancient Celtic Druids believed the evergreen was sacred and represented everlasting life because it did not shed its leaves as the deciduous trees did. 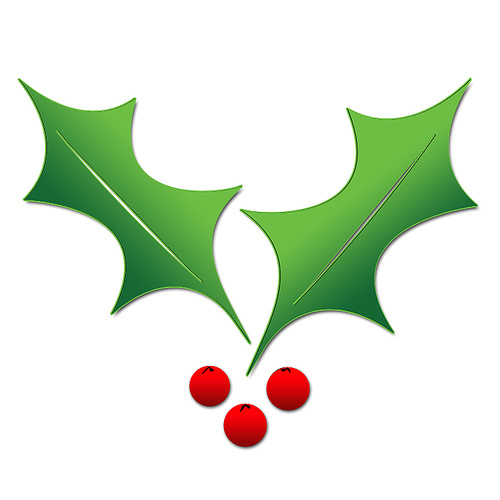 They used the evergreen, holly and mistletoe to decorate their temples and perform rituals during the winter solstice. Today’s Druids continue to recognize the winter solstice. In fact, just in time for the 2013 winter solstice, Stonehenge is reopening after a multimillion dollar makeover. It is anticipated that modern Druid attendance will outstrip previous years. In ancient Rome, the people knew that the winter solstice meant crops would eventually return and food would once again be growing in the fields. They marked the occasion with the feast of Saturnalia to honor Saturn, the god of agriculture. Homes and temples were filled with evergreen boughs to celebrate new growth and fruitfulness. The Vikings believed that cold and evil spirits would come out during the winter solstice. They put wreaths over their doors and brought whole evergreen trees into their homes in order to protect themselves against the evil. The burning of this large tree or log eventually became the yule log tradition we know today. By the 16th century CE, German Christians were putting up evergreen trees in their homes as symbols of their Christian faith. Some say this was due to the legend of St. Boniface who came to convert the Vikings in the 8th century and turned their traditional pagan rituals using the evergreen into symbols of Christ’s triumph over death. January 1, 1870. John Whetten Ehninger, American, 1827–1889. Block: 34.9 x 23 cm (13 3/4 x 9 1/16 in.). Wood engraving, illustration for Harper’s Bazaar. 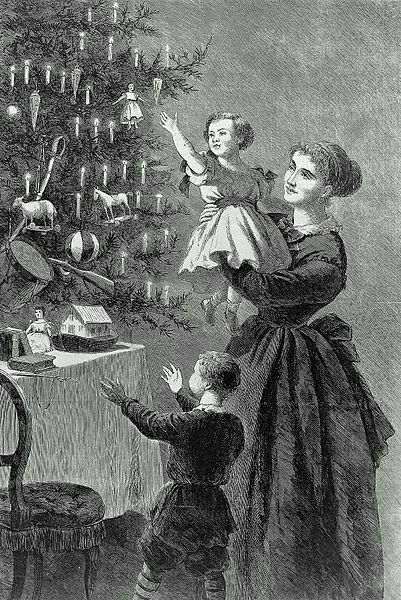 The Germans brought their Christmas tree tradition with them to the New World and community trees were seen in Pennsylvania settlements as early as 1747. The practice did not catch on quickly as many Americans thought the trees were silly. It took time for the decoration to spread to the rest of America and then throughout the world. Eventually, decorated trees became Christmas tradition as the holiday was popularized by Moore’s The Night Before Christmas, Dickens’ A Christmas Carol, and Nast’s Santa Claus cartoon. Just in case you forget all of these interesting facts, take this free bookmark as a gift from us to you this holiday season. Use it to hold your place in your favorite holiday book! Click below to download a high resolution, printable jpg. 3.Thorpe, Vanessa. “STONEHENGE UNVEILS ITS £27M MAKEOVER IN TIME FOR THE WINTER SOLSTICE”, The Observer, 13 December, 2013. This entry was posted in Blog, Holidays, Public Life, Religion and tagged ancient history, AntiquityNOW, Celtic Druids, Christmas, Christmas tree, date palm, evergreen, holidays, Ra, Saturnalia, winter solstice, Yuletide. Bookmark the permalink.